A novel detection algorithm based on color, depth, and shape information is proposed for detecting spherical or cylindrical fruits on plants in natural environments and thus guiding harvesting robots to pick them automatically. A probabilistic image segmentation method is first presented to segment a red–green–blue image as a binary mask. Multiplied by this mask, a filtered depth image is obtained. Region growing, a region-based image segmentation method, is then applied to group the depth image into multiple clusters. Each cluster represents a fruit, leaf, or branch that is later transformed into a point cloud. Next, a 3D shape detection method based on M-estimator sample consensus, a model parameter estimator, is employed to detect potential fruits from each point cloud. Finally, an angle/color/shape-based global point cloud descriptor (GPCD) is developed to extract a feature vector for an entire point cloud, and a support vector machine classifier trained on the GPCD features is used to exclude false positives. Pepper, eggplant, and guava datasets were captured in the field. For the pepper, eggplant, and guava datasets, the detection precision was 0.864, 0.886, and 0.888, and the recall was 0.889, 0.762, and 0.812, respectively. 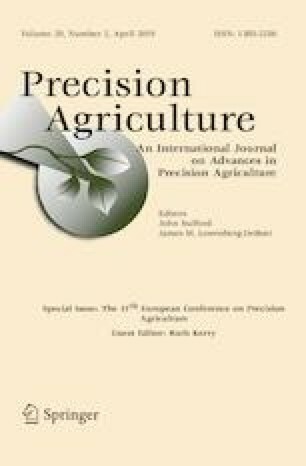 Experiments revealed that the proposed algorithm was universal and robust and hence applicable to an agricultural harvesting robot. This work was funded by a grant from the National Natural Science Foundation of China (No. 31571568) and a grant from the National Key Research and Development Program of China (No. 2017YFD0700103).